Over Winter break, I wanted something quick and easy for dinner, and had this crazy idea to bake ravioli til it was crispy instead of boiling it like I typically do. Of course, I figured I wasn’t the first one with the idea, so I googled baked ravioli and found a recipe from Land-o-Lakes that looked like it would do the trick. 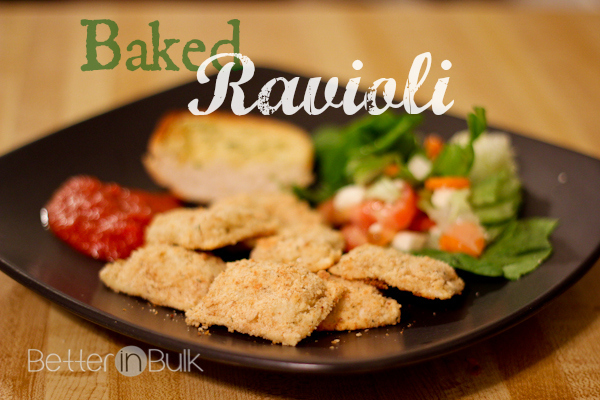 My family and I already love ravioli, but these baked ravioli were so much fun. And they were perfectly delicious with Rose Romano’s marinara with red bell peppers. And who doesn’t love eating dinner with your fingers instead of with a fork?! Heat oven to 375°F. Take ravioli out of freezer and let thaw slightly. Combine bread crumbs and cheese in a medium bowl. Combine sour cream and milk in a separate bowl. Dip ravioli in sour cream mixture, then in bread crumb mixture, and coat evenly. Place ravioli in single layer on baking sheet covered with aluminum foil. Bake 10-14 minutes or until ravioli are crisp and lightly browned. Serve immediately with pasta sauce. Note: I received a gift box of Rose Romano’s sauces a few months back, but I was not compensated in any way for this post. Looks Yummy! I found you via your featured post. I will have to try this sometime. Never tried baked ravioli before. Now I am curious to do so! Stumbled. These sound amazing. I love Italian food and could eat it every day! How clever!!! Love that idea.